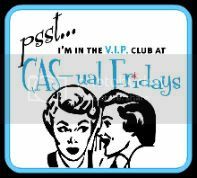 This is just a quick one as it's nearly bedtime and the CAS-ual Fridays challenge for this week ends in a couple of hours! Really pushing it this time! The challenge is to use scallops. I used my Fiskars scallop punch on a piece of cardstock that I coloured with Scarlet Versacolor ink (please ignore the 'rough' look that the scallops have, I did sand them, but obviously not well enough!). The sentiment is from Fanciful Flowers by AnnaBelle Stamps stamped in Versafine Onyx Black ink. I stamped the heart with the smaller gingham pattern from BBD7 by AnnaBelle Stamps in Scarlet Versacolor ink and punched it out with a large heart punch by Sullivans. I adhered it to a piece of white cardstock (same as the cardbase) and cut around it leaving a thin border with my Cutterbee scissors. Popped it up with foam dots to complete the card. Well that's it from me (told you I would be quick!). Thanks for looking and have a fabulous day! Beautiful use of red and white! I LOVE this Jess! So awesome! Love the clean look! Great design, Jess! So little ....yet it says so much!! LOVE it! Thanks so much for joining the fun with us at CAS-ual Fridays!Hope to see your beautiful work again! Sweet card Jess. Love the gingham heart...I agree with Virginia...so little - yet it says so much! LOVE your BBD heart! Another perfect card Jess! You are so special + giveaway! For You (again) + AnnaBelle Stamps release!